New York Times bestselling author and respected pastor, Rick Warren, takes children on a whimsical and heartfelt journey as they explore God's love through this delightful picture book. 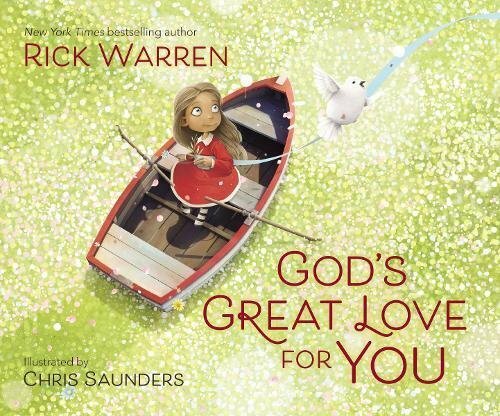 Illustrations by Chris Saunders paired with Warren's prose teach children that nothing can separate them from God's great love. It's sure to become a treasured family favorite! This has some gentle, comforting illustrations that illustrate some of the wonderful ways that God shows His love for us. It begins with creation and animals and continues to talk about just how much God loves us. Saunders has created whimsical illustrations that complement Warren's text. The cover shows the style of illustration quite well. This is a lovely cuddle up and read aloud book for young children. It also would be good for emergent readers, because the print is large. I like it. We all need the reminder of just how much God loves us. I have always loved anything by Rick Warren and had not heard of this book yet. Thank you for your review on it! I like Rick Warren, too! I will def. have to check this book out. I is a lovely book. How are you? Hi, I am feeling better. Thank you for asking. I'll write an update soon. Looks like a delightful book for children Laura! I'm continuing to pray for you and for your family through this tough time!